Thankfully, I have always loved reading and can never have too much reading time. I typically read multiple books at once and often listen to a different audio book (I know you’re supposedly not supposed to do this, but it works for me). In Morocco, I have set up a system. I try to read four books at once: one book about Morocco and/or the Amazigh people, a book about philosophy or theology, another non-fiction book, and a fiction book. While I switch between these in my free time, I also listen to an audiobook while I cook, clean, or travel. Below I have included my five recommended books with small descriptions. At the bottom, I included a full list of all the books I have read since joining the Peace Corps. This beautifully written work of fiction tells the story of a girl growing up in a harem in Fez, Morocco. It allows a rare glimpse into an way of life quickly disappearing. Told by accomplished sociologist Fatima Mernissi, Dreams of Trespass does not fail to educate while it simultaneously entertains. The writing is witty and the world built by the author vivid and lively. The Weight of Glory is not a book by C.S. Lewis but rather a collection of some of his shorter writings, radio presentations, and lectures. The book covers questions of pacifism, materialism, the pursuit of education, and, of course, theology. I was surprised when reading it how many of the quotes I recognized. While it is certainly difficult to choose any work by C.S. Lewis as superior to others, The Weight of Glory is probably now my favorite work, or collection works, by Lewis. One Writing should be, in my opinion, required reading for any creative composition class. The book not only serves as a memoir, but also as a book of advice and encouragement to aspiring writers. King is frank about the hardships of a career in writing while also being honest about personal failures–most notably, his struggles with substance abuse. Part memoir, part textbook, part self-help book. I highly recommend this book even for people not interesting in writing or King’s works. The Lies of Locke Lamora follows a band of charming swindlers–led by the clever, sarcastic, and arrogant Locke Lamora–in a fantastical, Venice-inspired city as they con nobility and scoundrels alike. I have never laughed out loud reading a novel as much as I did reading Lynch’s masterpiece. The book is incredibly quotable and balances its humor with plenty of action and drama. Recommended for fantasy fans and non-fans alike. The book has already spawned two sequels (with four more planned) and Warner Bros purchased the rights to make a film. Despite appearances that appear to the contrary, I do not live alone. I live with many roommates, a lot of whom seem to have issues with the boundaries I have attempted to establish in my household. I have decided to introduce my housemates to my wide readership, along with their names in English, Moroccan Arabic [Darija], and the indigenous language spoken in my region [Tamazight]. This is just a baby. One of them, the one I was too panicked to take a picture of, was bigger than my hand! Every great hall in history has been bestowed a grand title by its builders or their predecessors, grand labels to communicate the majesty of these marvels of architecture, these pinnacles of civilization, these seats of the great kings and emperors of the world. The names of these wondrous constructions travel far and wide on the tongues of the awe-struck. They become household names and enter the annals of history as the great wonders of the world. Names serve to preserve and honor these glorious and beautiful structures. I have so named my house, my home, my royal palace. I thought long and deep on the innumerable merits of my dwelling place, my manor, my alcazar. One cannot easily communicate the countless hours spent, both conscious and sleeping, in the home. The home is where one formulates their schemes to change the world, to pursue their dreams. I want to reveal my home in this blog post for those who are unfamiliar with the illustriousness, the nobility, and the glory of my domicile so that on every tongue it shall be spake with awe and wonder, accompanied by tears of joy. Not this month due to a faulty faucet, but I have had it. Yes, and my yard’s door, and my bedroom door. I have data on my phone, but am unable to purchase wifi for my home as this requires my town to have phone lines. Surpise! My town does not have phone lines. To further elaborate on these accommodations I have been afforded by my small mountain village, I will give you the grand tour of my wondrous abode, my shining jewel of the High Atlas. I am quite happy with my living arrangements, and like my days spent reading in bed, frying eggplant in the kitchen, or doing laundry in giant bins in my yard. I share this home with a very special Moroccan street dog named Kika, which means “cake” in Moroccan Arabic. She calls it home as much as I do. Welcome, ladies and gentlemen, to the Wormhole. Let us begin the tour with the view from the street. It is lovely, is it not? The fence is constructed with bamboo, clay, straw, and stones. The house itself is constructed with clay, small stones, and straw. The door and bars on the windows are metal. Fun fact: many homes in Morocco are constructed of cement, so but cement does not regulate temperature as well as mud, so these homes are warmer in summer and colder in winter. The view from the front porch is to die for. My yard was a mess, but when my family came to visit, my father and my brother Nick were incredibly helpful. The constructed a fence for a rubbish pile, a small fire pit for burning my trash (there is no trash pickup), and a small pit for compost. The first thing you will notice when you enter is my main hallway. It has been bedecked in flags honoring Morocco and the Amazigh people. Kika enjoys such activities as: getting caught in the mosquito net, barking at strange noises in the yard, and standing in front of my screen, demanding attention. I do sleep under a mosquito net at night, and my bed is a collection of flat ponges and blankets under a sheet. Kika and I enjoy an evening of shelling peas and watching The Girl with the Dragon Tattoo. Let us move onto the spare room, where I store clothes and extra stuff belonging to Kika. You can also see my yoga mat. I have a giant propane tank (a butagaz) that I hook up to a portable stove to cook. I am proud of my array of spices. Notice the haphazard construction of the spice rack. Watch the nails! And, lastly, onward to the bathroom. I do not have what you most likely think of as a toilet. What I have is oftentimes called the “Turkish toilet.” It is a hole in the ground flushed using water from a bucket at the side. Squatting has become a way of life. Truly healthier for you, according to all the experts. Yes, I know it’s a little late to be posting about Christmas. Four months late, in fact. Better late than never, right? I would like to continue to use this blog to inform my friends and family and whoever else might stumble upon it about my Peace Corps experience. One of the questions I get asked the most is what I did for Christmas. We swore into Peace Corps at the beginning of December, and so were unable to leave the country. Some friends and I decided to get together to celebrate the holiday not really recognized in Morocco. A PCV from the staj before us who had her own apartment was kinda enough to let four of us stay at her place while she traveled for the holiday. Starting off: it was cold. Internal heating isn’t really a thing here in Morocco. That combined with cement buildings with cement floors and poor insulation leads to a very freezing experience. I spent the entire three days sitting/laying/bouncing around in my sleeping bag. I particularly remember wishing I had brought more than two pairs of socks because they were were not warm enough for me despite the fact that I was wearing both of them at the same time. We did not really do much for Christmas. It was mostly an excuse to see each other (we are encouraged not to leave site a lot during the first three months), spend some time speaking English, and binge watch Netflix (we had internet!) without interruption. I spent most of the time blowing through two entire seasons of Black Sails on my own. There was one day where I did not watch anything/play any games with the other PCVs – just enjoyed my introvert time. We also watched all the Christmas episodes of The Office, played some board games, and cooked American food (PCVs should understand the sacredness of these rituals). We got a little creative. Props to Matt for the Egg Nog! Mashed potatoes, guacamole, fried eggplant, quiche, and Nutella. A veritable feast complete with tea candles. I was able to Skype my family back in the States while all bundled up in my sleeping bag and wearing my Santa hat. I hope you enjoy the pictures! There will be more posts to come now that I have access to a magical internet stick (aka USB modem) that gets acceptable reception on my porch at 11pm. We ate a lot of spaghetti. Go figure. So, tomorrow I swear in and move to my final site on Saturday. My final site is pretty baller, as you can tell from this wonderful picture. It is an oasis in the mountains around Errachidia, to the east near the Algerian border. It is about eight hours from Marrakech and seven from Meknes. My site mostly consists of a town center surrounded by farms. Various duwars (neighborhoods) are spread out over the the fields and into the mountains. I live in a duwar about a thirty minute walk from the center. During this walk, I pass through farms and have to cross a river using stepping stones. I cannot tell you exactly where I will be as it is a security concern. Sorry, folks. The river I have to cross every day. See those stepping stones? Yep. That time my family put me on a donkey and sent me off on my own. I had no idea where I was going. Illiteracy is a major problem among the women in my site, and I look forward to helping create literacy problems. Interestingly enough, though, was my experience walking through the farms. Women often work alongside their husbands in the fields, hitching up their gelabas around their hips and pulling the mules through the mud. One of the unique challenges of my site will be that Darija (Moroccan Arabic) is not the primarily spoken language. Tamazight, one of the only surviving indigenous languages of North Africa, is spoken predominantly in my town. While there are a lot of cognates between Tamazight and Darija, Tamazight is ultimately its own language with a different language and everything. If you can read Arabic transliteration, the same system is used for Tamazight and you can hear in your head how difficult Tamazight can be to pronounce. All in all, I look forward to moving to my new site and will keep you posted as often as possible! I guess it is time that I write for you about my training site and family. Peace Corps Morocco divides its PCTs (Peace Corps Trainees) into small groups of six for a period of training called CBT (Cultural-Based Training), also called PST (Pre-Service Training) for a period of about two and a half months. Each group is then assigned a CBT site that can range anywhere from a semi-urban neighborhood, a small farming town, a mountain village, etc. An LCF (Language and Culture Facilitator) is assigned to each CBT group, and they act in a professional capacity as a Darija (Moroccan Arabic Dialect) teacher, a cultural tutor, and a liaison between trainees, the local authorities in the CBT site, and other Peace Corps staff. In an unofficial capacity, LCFs can also act (and almost always do) as a sounding board for ambitious ideas, a counselor that can offer assistance in the integration process, and as a translator in dire misunderstandings (can you tell yet that I love my LCF?). Each PCT is placed in their site with their own family. Some families are big, some are small, some are rich, some are strapped for cash, some are religious, others not so much, etc. As you can probably already gather from my description, each trainee’s experience will differ significantly from the next. Even within CBT groups, there are a variety of different experiences and feelings regarding Pre-Service Training. My CBT experience has had its ups and downs, but I have really appreciated and come to love my site and family. My site is a small farming town with a population of less than 2,000 located about 30 minutes outside of Meknes. It is a conservative town with a wide variety of ideas and practices. Some families are Arab and some are Amazigh. The town is warm in the summer and moderately cold in the winter. I say moderately cold, but what I mean is it gets down into the 20s and 30s and there is no internal heating. Moroccans are experts, however, at enduring bone-chilling winters without heat. I have learned a trick or two from them. This is a much more common occurrence than you would imagine. I do have running water (no hot water) and electricity (unreliable as it is), which, compared to other Peace Corps countries, automatically labels Morocco as a “Posh Corps” country. My family consists of a young Amazigh couple (my host mom and dad), their two sons (6 and 3 years old), and the husband’s parents, my host grandparents. I truly love them. The grandparents are from the Rif region up north, near Nador, and they speak a dialect of Tamazight called Terefit. Their children were born and raised in the town itself, while my host mom was born in the mountains around the town. She speaks a dialect of Tamazight closer to that which is spoken in my final site and has been very excited to share her first language with me now that I know I will have to learn that in addition to Darija. She got married at 16 and never learned how to read, but she has been working on her alphabet recently and has started to be able to recognize words. My host dad encourages her in this endeavors, which is really great to see. The little boys can be a handful, but I have enjoyed being “sister.” My grandma is great too—she’s an absolute coffee fiend and loves to make it for our class. Turns out, her father was a Sufi holy man whose teachings were highly regarded and who committed much of his time and many of possessions to the poor. Through her side, my family can trace its lineage back to the Muslim prophet Muhammad. The family is incredibly hospitable, and not just to me. They have adopted my LCF as if she was a member of the family and it’s not unusual for them to ambush my CBT mates and force a meal upon them. As far as gender roles go, the town is a conservative town, and most women stay at home. I am fortunate to be in a wonderful family where women are valued and cherished. My host mom and her sister-in-law go to the souk (weekly market) every week and buy food for their households. My host grandfather is very actively involved in the boys’ lives, walking them to school and assisting in discipline. My host dad is great with his kids and will sometimes make dinner (a very unusual thing in Morocco). He actually stopped me from washing the dishes yesterday because he wanted to do them himself! Due to my previous experience with Arabic, I was placed in an advanced CBT group. While we certainly have learned quickly and feel we have accomplished a lot (conducting an employability workshop entirely in Arabic, teaching English classes, etc. ), we know there is a long way to go and that in the Peace Corps, you never stop learning. Struggle bus: all day every day. Notice that our LCF is driving the bus. In less than two weeks, I move onto my final, permanent site. While I am ready to begin my service as a PCV, I am will be sad to leave this little town. It has taught me a lot, and I truly do love my family. I’ll miss my CBT group as well. We will all be scattered across the country, and it truly is a bonding experience. Note: If you are a visitor to my blog getting ready to pack for Peace Corps, congratulations! This is not a complete packing list, just some suggestions that I have found helpful during my CBT. Everyone is different and will want different items, so I suggest taking any list as loose suggestions. Particularly, be wary of any list that tells you what clothes you should bring. Bring country appropriate clothing that you will wear. Every list will tell you to bring two pairs of jeans – I didn’t bring any. You know why? Because I hate jeans. I would never wear them. If you hate jeans, don’t pack them. If you hate maxi skirts, don’t pack them. If you hate leggings, don’t pack them. If you love cardigans, pack as many as you want. Moroccan slippers – use them everyday. Moroccans wear shoes in the house and slip them off on the carpet. My classmates have taken to using mine when they have to leave the carpet temporarily. Go Pro – small with great pictures. Easily hidden. More hair stuff (including a good hair brush) *maybe a little different now, since Micah chopped all my hair off. To keep all my faithful readers updated, I have composed a post with little highlights from my first couple weeks in country. There are the normal struggles (learning Moroccan Arabic, aka Darija, trying not to make cultural missteps, and trying out fun and exciting new digestive patterns) and then the fun parts of living in Morocco. I had one of the most terrifying moments of my life the other day. My first evening with my host family, the staff member assigned to my CBT group sat down and had dinner with us. The family was eager to get to know me, so my instructor assisted in helping me answer some of their questions, albeit begrudgingly. Trying to differentiate Darija (what I am supposed to be learning) and Tamazight (a Moroccan language that changes drastically based on geography and I might have to learn eventually) can be a challenge. When you have traveled a bit and have had your share of cultural crash courses, sometimes you forget among the culture shock about how people from other cultures must view you. And let me tell you: Americans are weird. Along the lines of Americans being weirdos, one of the habits I have noticed that intrigues my family is the use of my Nalgene water bottle. The Peace Corps Medical Officers told trainees that it is very easy and very dangerous for PCT/PCVs to become dehydrated. In order to counter that, a lot of us have developed a habit of keeping a water bottle with us at all times (a habit many Americans keep back in the States anyway). I am told it is not rude to drink this in the house, especially if you offer some water to those near you, but it is odd. Every time I pull out my water bottle, someone makes a comment about Karima being thirsty or drinking a lot of water. My little host brothers (6 and 3) were intrigued enough to wrestle it from my hands my first night and run away with it. After that, my host dad filled up a used Fanta bottle with water and now the 3 year-old breaks it out whenever I have my bottle with me and offers to give me some of his water. You’re muskina. I’m muskina. We’re all muskina. The first word I learned from my host family was the delightful little descriptor of muskina. The only equivalent my class and I could come up with for the way it is used is the southern phrase “bless your heart.” This adjective is used similar to “poor thing,” but not as pitiful. Mother: This is Karima. She’s American and studying Darija. Random woman in hamam: Oh, muskina. Grandma: Do you like your henna, Karima? Me: Yes. It’s very beautiful. Me: Good night, everyone. I am going to go to sleep. Grandma [in another room, not visible]: Muskina. Me [to host mother]: We saw a donkey today making noise. He was being very…Naima, what’s the word for loud? Naima: Here, I am not your language instructor. Here, I am just Naima. So here I am answering all your questions. Again. As I did the last time I traveled, I will put out a brief FAQ for those who have many questions as to what I am doing. Here they are for your enjoyment. Do any of the views expressed in this blog reflect those of the Peace Corps or the United States government? In January, I accepted an invitation to join the Peace Corps as a Secondary Education English Teacher and serve in Morocco. Where will you be stationed? I do not know at this time where I will be placed permanently after my three months of training, but even then I will not be posting online where I am placed. If you want to email or message me personally, I will tell you when I find out. Are you there will people you know? 110 people from all over the USA were invited and cleared to serve in Morocco. I did not know any of them previously, but I have made friends quickly. Peace Corps searches and screens for the best and brightest, and these people are interesting, talented, intelligent, and diverse. I am proud to serve with them. Message me privately and I will figure something out with you. You probably know that the official language of Morocco is Arabic. What you probably did not know is that the language of tamazight is also an official language. You probably know that French is widely spoken in Morocco. What you probably did not know that Spanish is spoken in place of French in some areas of Morocco, mostly in pockets in the north and south. You also probably didn’t know that while Modern Standard (MSA) Arabic is the official language of Morocco, spoken Arabic is incredibly different. And I don’t know mean different as in colloquial. I mean, as in no one calls it Arabic. It’s called “darija,” which means colloquial, but is so different that people who understand MSA and/or other, more mainstream dialects of Arabic cannot understand it (including my Arabic professor). Darija is truly a hybrid language – mostly influenced by Arabic, but it also borrows a lot of words from Tamazight and French. I knew I was in trouble when the first Moroccan student I met listed off the languages he spoke and listed “darija” and “Arabic” as different languages. You stick out. Like, a lot. Sure, Morocco is a lot more diverse than Palestine was, but walking down the street in downtown Rabat with my red hair and freckles attracts a lot of attention. Everywhere you go, you are going to get stared at. When I ride the tram across town, I am usually the onl y obvious foreigner in the tram car and it turns into an awkward 10 minute ride of continuous stares. I was actually mistaken for a Moroccan the other day, which was pretty shocking. It was the perfect storm for the misidentification. I went to the post office to pick up a package and was wearing a sweatshirt I had gotten in Chefchaouen, a city in the north of Morocco. I had also wrapped my hair in a scarf. You must understand that a lot of Moroccans from the north, particularly Chefchaouen, have light skin. I walked into the post office and sat down, waiting to get the counter and overheard one of the workers ask his manager if I was a foreigner. She said “No, she’s from Chefchaouen.” They realized I was a foreigner as soon as I opened my mouth. I thought the mistake was funny so I told my host mom later. She laughed so hard I started to wonder why she thought it was so funny. I guess she was surprised that there was an context in which I could be mistaken for a Moroccan. While mostly unthreatening, the street harassment in Morocco is a huge issue, and being a foreigner makes me stand out more and be the target of more jokes. It usually only happens when I am alone, but also when I am with a group of girls. If I am with a guy, especially a Moroccan guy, it’s pretty rare. Me: Hello! How are you? Host mommy: I’m good, praise God. Everything is good. How are you? Me: I’m great. How was work? Mommy: It was good, praise God. Me (attempting something daring and new in darija): I had French class today. Mommy: Good. Class was good? Me: Class was very good. We learned about politics. Me: Yeah it was very good. Me: Well, I have a lot of homework. Then I usually retreat to my room and close the door. I will venture out for dinner later, but now is not that time. I will worry about that social interaction later. Truth be told, a host family is a great experience, just a little awkward at times. 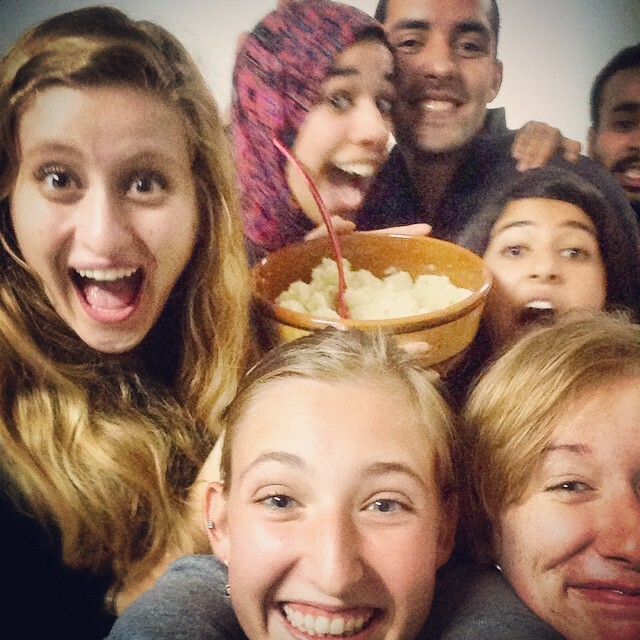 Couscous fridays are great, teatime is fun, and the level of cultural and language learning that takes place in a host family’s home is irreplaceable.